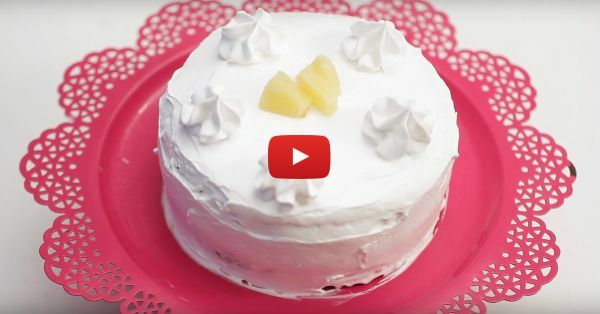 How To Bake A *Yummy* Pineapple Cake At Home! Hi there! Having a dull day? Don’t worry! I’ve something to tell you. Yes, you. Are you ready? Okay! Here we are with a recipe that will brighten up your mood like it’s the weekend again! It’s easy, it’s eggless, and it’s amazing. Read on to find out how to bake a yummy-in-the-tummy pineapple cake at home! - Grease a 7” baking tin and line with parchment paper. Set aside. Preheat oven to 160 C.
- In a large bowl, beat butter until creamy. Add sugar and vanilla essence and beat again for 3 minutes. - Add in flour, baking powder, and hot water and mix well until combined. - Lastly, add in the curd and mix well. Pour the batter into the prepared baking tin and bake for 45-50 minutes or until a skewer inserted comes out clean. Let it cool completely before icing. - Whip the whipping cream in a large bowl until stiff peaks form. Keep it in the refrigerator until use. - Cut out the top bulging portion of the cake to level it. Slice the cake in half. - Poke holes into the cake and pour the pineapple syrup from the can. - Spread a thick layer of cream on the first layer. Top with diced canned pineapple. - Place the second layer on top. Repeat the process. Decorate with more pineapple!